The Islamic Center of Lansing is located in East Lansing, next to the Michigan State University campus. 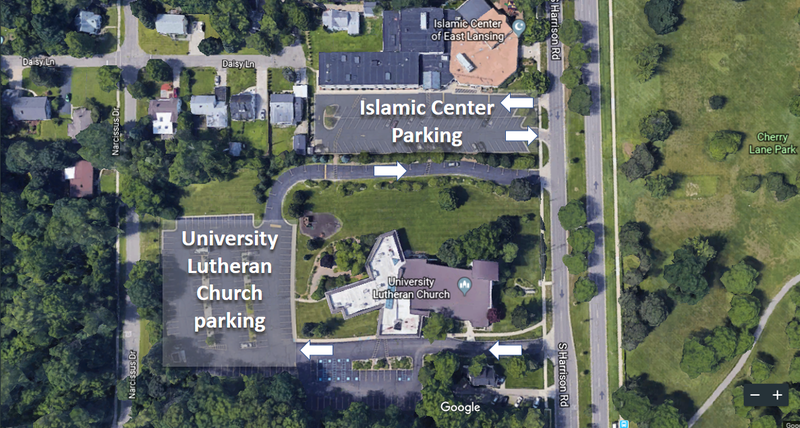 Some landmarks close to the Islamic center are the Kellogg center, the Spartan stadium and the Train Station etc. 1. Please do not park on the Streets behind/around the Masjid except by Parking Permit. 2. Drive slowly on the driveways when parking. 3. Please do not Double Park or block the Driveway. Do not park on the Lawn, even partially. 4. Do not leave your car on the Masjid parking lot other than at prayer times. Any car left overnight will be deemed as abandoned and will be ticketed and towed away.